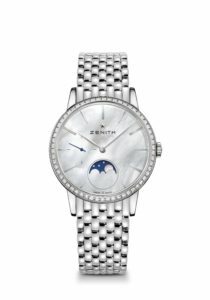 Elitism goes for cult status as Zenith launches three spectacular new models of its iconic Elite Lady Moonphase collection in stunning stainless steel… with a sparkling hint of diamonds. Refined lines, simplicity and refinement. 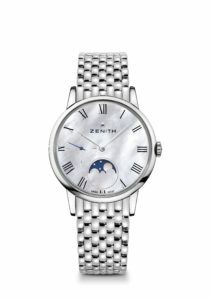 With its distinctive pebble-shaped ultra-thin case and slightly domed dial with engraved stylized hour-markers or painted numerals crossed by slim leaf-shaped hands, Zenith’s ELITE line is as discreet as it is captivating. Stylish and timeless, this is the urban elegance must-have with an airy sport-chic edge to it. Finished with a fluted crown and ergonomic lugs perfectly moulded to the wrist, the slender curves of the ELITE incorporate all of Zenith’s watchmaking expertise with Manufacture mechanical movements. This classic design pairs modern accents with a streamlined form to produce a timeless look sure to please those who appreciate stylistic minimalism where perfection is in the details. 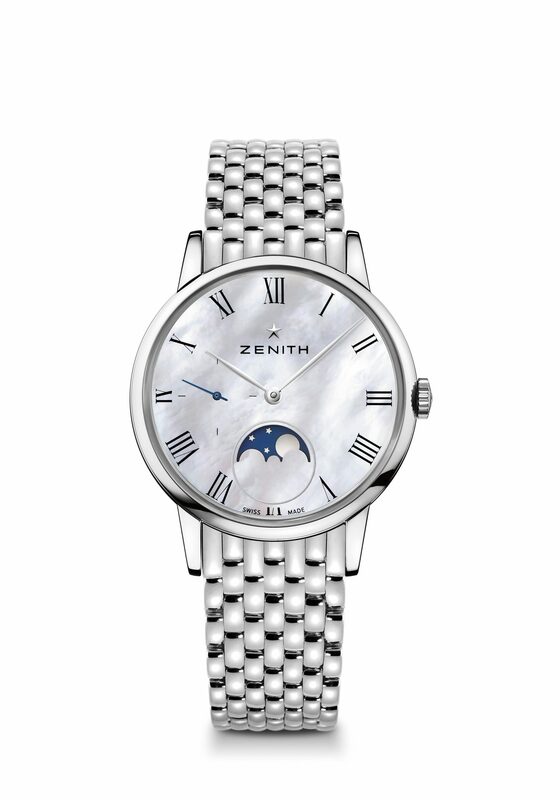 In 2018, exuding a certain sophisticated classicism all of their own, the latest in the ELITE LADY MOONPHASE line-up provide an irrepressibly elegant, utterly feminine flourish to Zenith’s ladies’ collection. 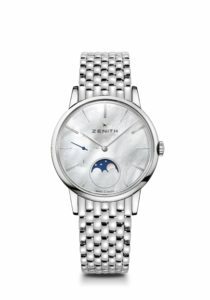 Unmistakably contemporary yet effortlessly timeless in its own right, the ZENITH ELITE LADY MOONPHASE has it all, and comes to the party with a solid stainless steel 36 mm case and matching bracelet, as it calls the shots with a gleaming white mother-of-pearl dial and Elite 692 automatic calibre. With leaf-shaped, rhodium-plated or blued hours and minutes hands in the centre, small seconds at nine o’clock and moon phase indication at 6 o’clock, these delightfully feminine models know exactly when it’s time for… whatever’s next. With a power reserve offering more than 50 hours on the go, this ultra-slim movement operates at a frequency of 28,800 vibrations per hour and consists of 195 parts – while measuring an exceptionally trim 3.97 mm waistline. And the advantage of a transparent sapphire crystal caseback means that one can always see exactly what these lovely ladies are thinking. This is where the similarity ends, however. 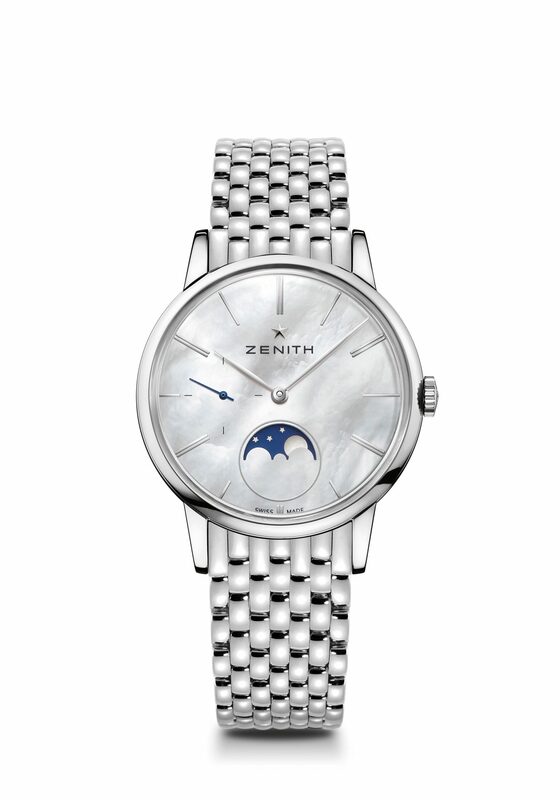 Living up to the notion that one’s face is one’s fortune, the ZENITH ELITE LADY MOONPHASE features three subtle but unmistakable differences to its otherwise identical exterior. Available with a choice of either discreet baton-type transferred hour-markers or more stand-out black Roman numerals for a bolder effect, the trio includes a version flaunting a breathtaking bezel afire with no less than 64 brilliant-cut diamonds totalling 0.90 cts. Barely out there and already totally timeless, the latest Elite Lady Moonphase is water-resistant to 5 ATM, offering the ultimate in round-the-clock elegance – from daytime sporty chic to fabulous after-dark glamor. 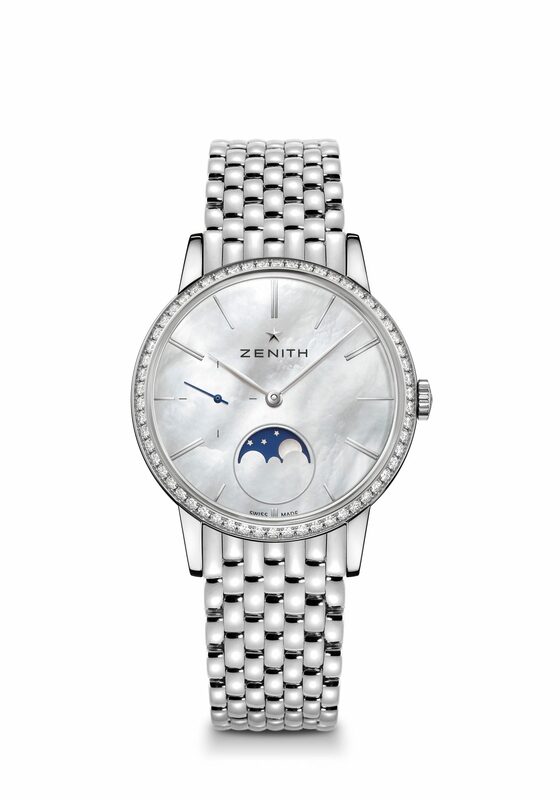 The epitome of contemporary Zenith elegance, the ZENITH ELITE LADY MOONPHASE embodies what a woman truly does for diamonds.